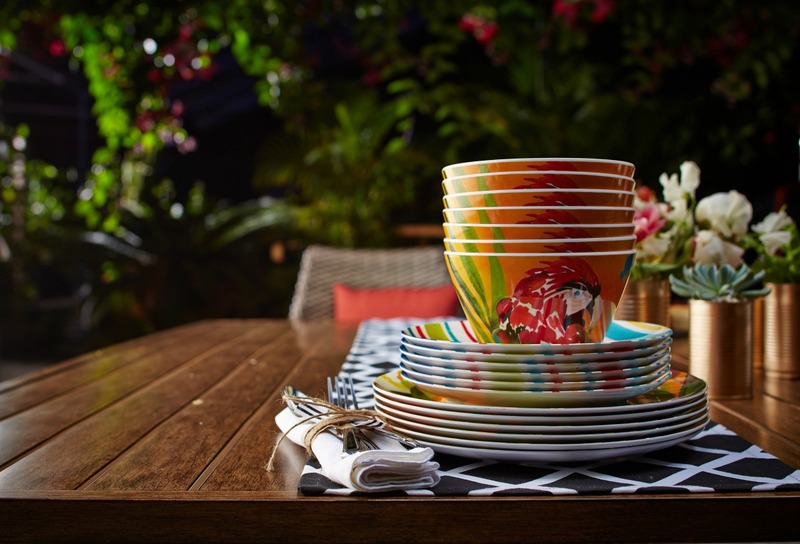 elliven studio: Celebrate Warmer Weather With the CANVAS Patio Collection! 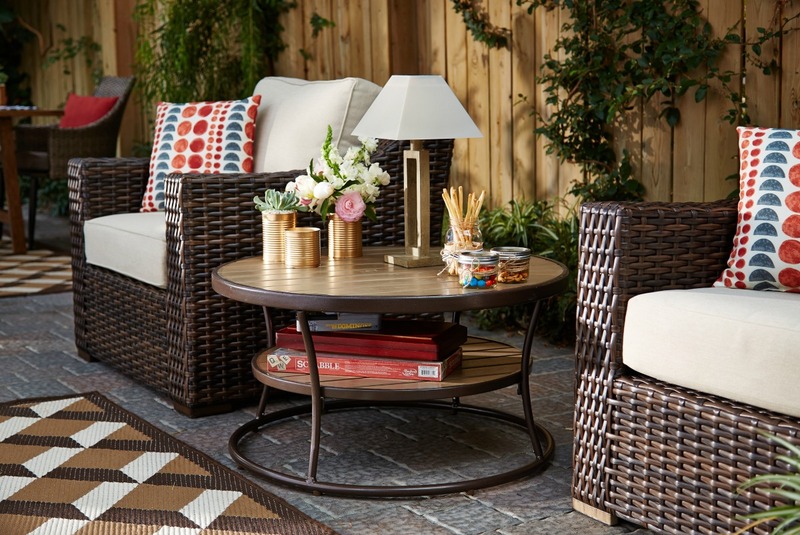 Celebrate Warmer Weather With the CANVAS Patio Collection! It's bound to happen, the arrival of warmer temps (right?!) 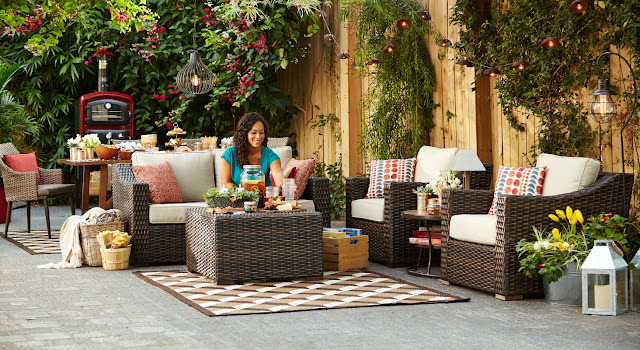 and soon, everyone will be dusting off their patio and begin to plan their backyard oasis for 2016! 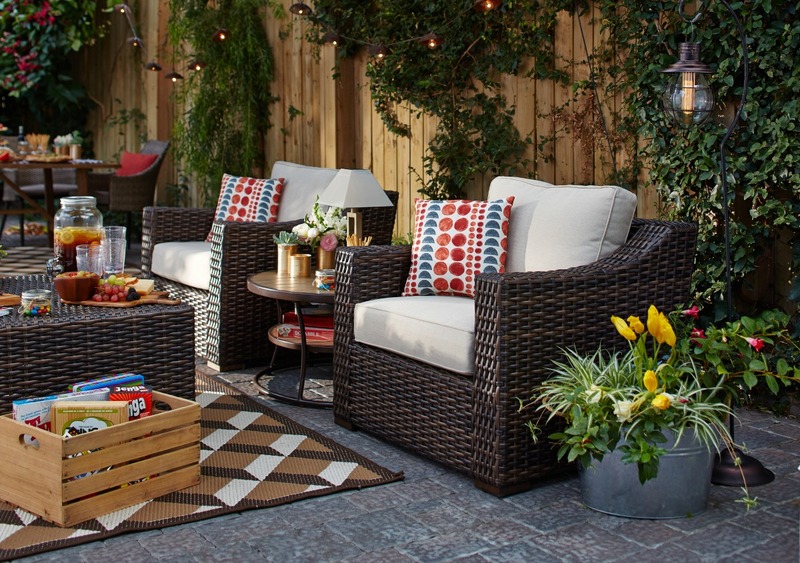 Back in November I had the chance to get a jump start on my very own backyard plans, when I met up with the wonderful Canadian Tire team to style pieces from their gooooorgeous CANVAS Patio Collection. I thought about my family and how we love to use our backyard space. The first thing that came to mind, a BBQ pizza party and games night! 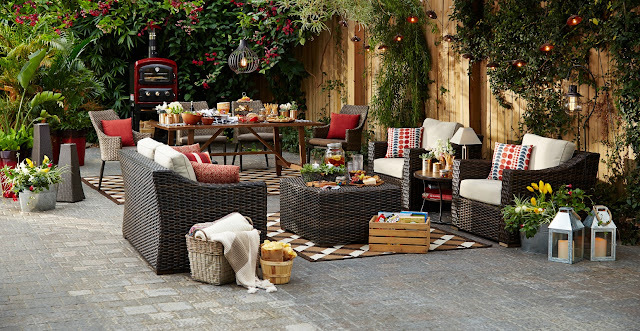 You will find us in our backyard most days and nights once the warmer temperatures arrive. Hubs and I start our day off by enjoying a cup of coffee on the deck and we typically finish the day there, enjoying a delicious beverage after dinner. Here in Canada, summer is rather short, so we are determined the make the most of it! Since the day we moved into this house, I've dreamt of having two designated areas in the backyard...one for dining and another for max-relaxing. So that's what I created for this wonderful collaboration! 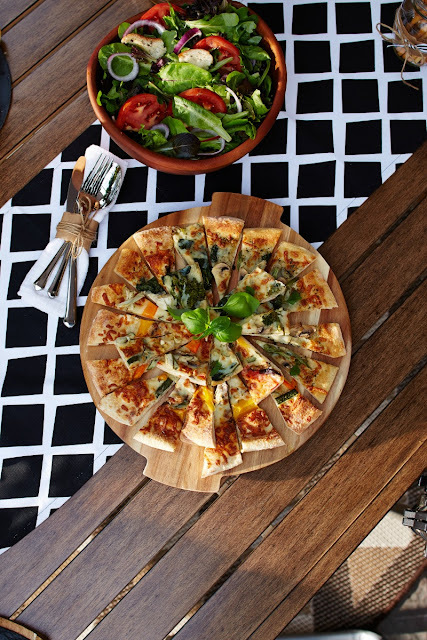 When hosting a BBQ pizza party, consider removing chairs from one side of the table so that your guests can easily help themselves to the delicious food. Wooden cutting boards play double duty. You can easily cut your pizzas into bite size pieces and leave them on the board for everyone to try! A cutting board and serving tray in one! 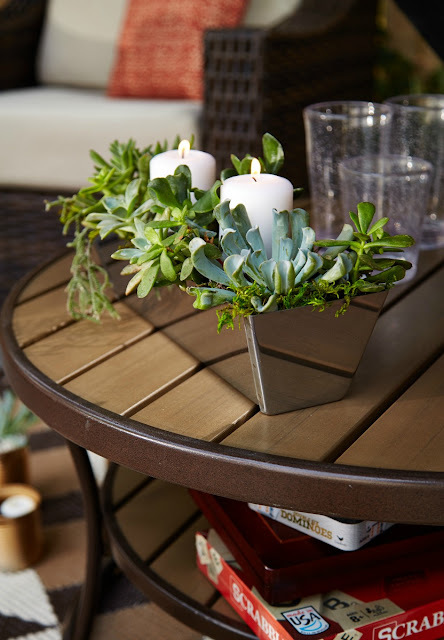 Two things that every patio needs are flowers and lanterns! 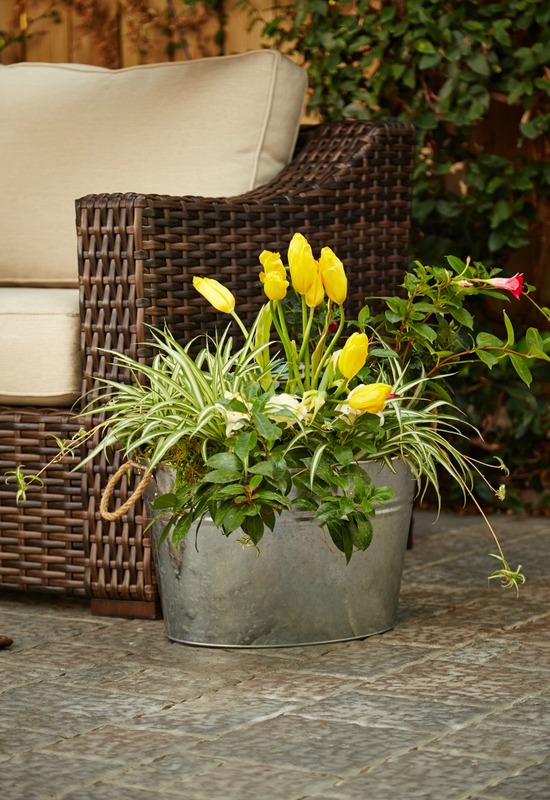 But why not use a party tub or a mud pan (yup, mud pan) for planters? Another quick and easy DIY: grab some old cans from your recycling bin, spray them your colour of choice (I went with gold) and again, use them as planters or add some water and a floating candle for an added touch of ambiance! 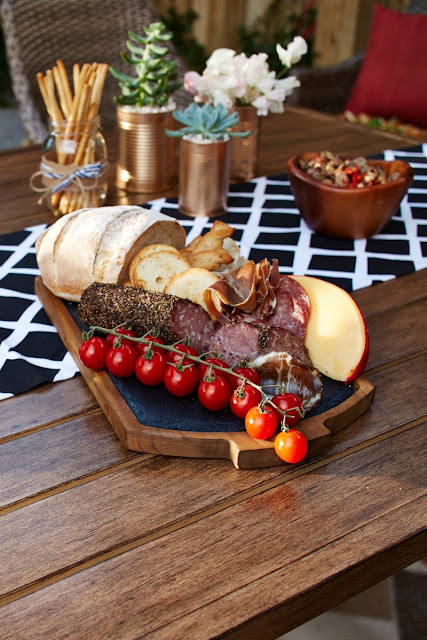 Brilliance is designing dishes that are both durable and beautiful (they do exist!). I adore these ripple tumblers and especially love how they make your beverage look over the top refreshing with the bubbles that are set within the plastic! Even more brilliant? Lamps that are solar powered and that bring a touch of interior style to your outdoor space! Add some pillows, throws, and finger foods and just like that, you have yourself an extremely warm and welcoming space for you, your family and your guests! 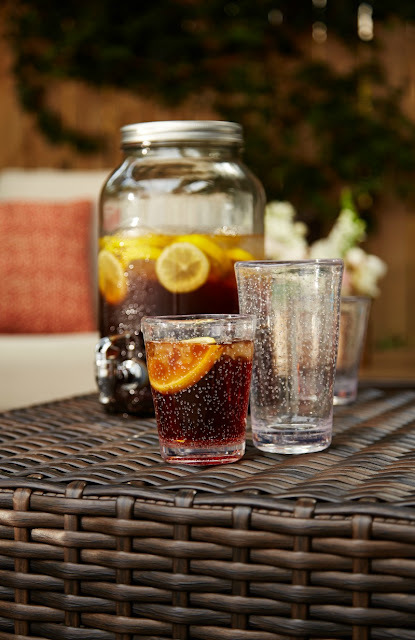 Hop on over to this Pinterest board to see more inspiration creating a fantastic backyard oasis! 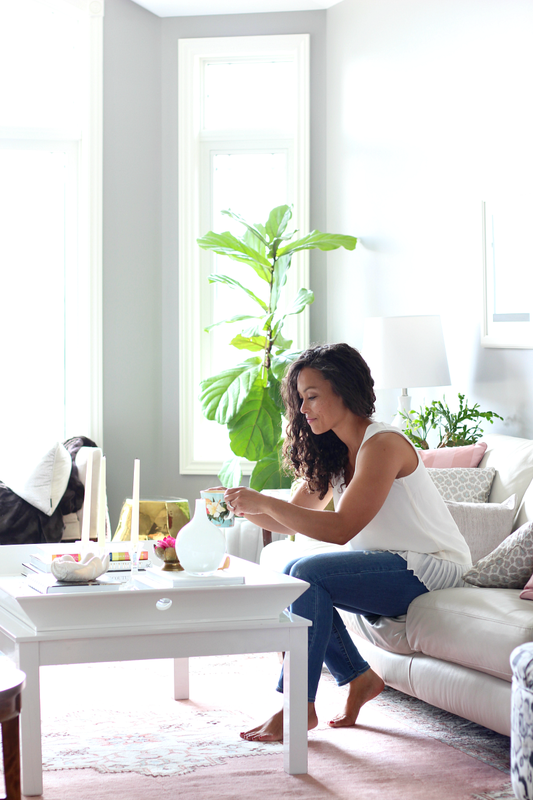 You can view some videos and other great decor ideas here! This post is a collaboration with Canadian Tire, all opinions are my own. 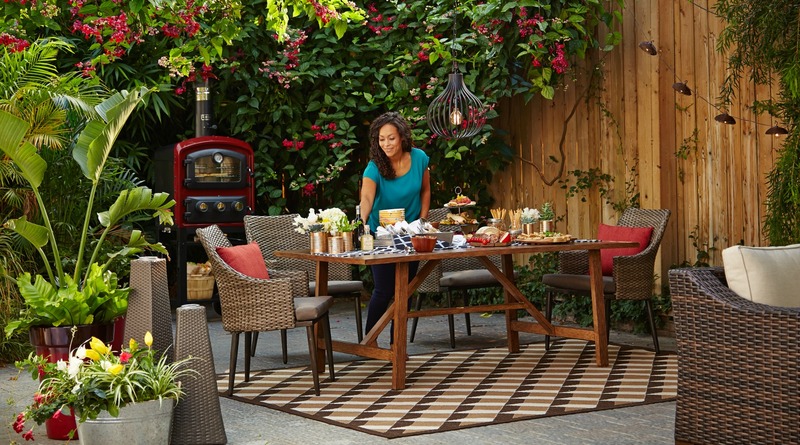 Julie this looks beautiful...great job styling this backyard!